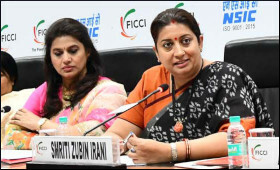 Textiles Minister Smriti Irani recently said that India's handloom sector has huge potential and to improve the livelihood of the weavers, it is imperative that this sector should be attached with the tourism sector. Speaking at the inaugural session of 'Hathkargha 2018', the two-day Handloom Buyer Seller Business Meet organized by industry body FICCI, Irani highlighted the need for youngsters to enter this sector and improve their income. "If one person weaves, there is another person of the same family who can give the history. There can be homestay which can also be propagated," she said. The Minister further added that the importance of developing the handloom sector lies in the overall development and training. It is important that the weavers are linked with the technological advancements and timely upskilling is the need of the hour. There is a need to digitally connect the weavers with consumers so that the direct connect helps in improving the business prospects, she added. The business meet showcases the Indian Handloom products and is promoting the message of Make in India and vision of 'India Handloom Brand' (IHB).